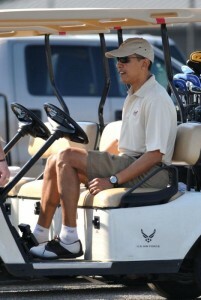 Soldiers Die While Obama Plays Golf | Virginia Right! When the going gets tough, and decisions need to be made, apparently President Obama needs a get away. Golf. In his first 9 months in office, the Slacker In Chief has played more golf than President Bush did in almost a three year span. Perhaps this is the reason Obama is unable to make decisions on additional troops for Afghanistan and how to complete the job in Iraq. Between date night, Nobel Peace Awards and failed Olympic lobbying trips, there just isn’t much time left for the business of the nation. Perhaps Obama should look into appointing a Leisure Czar to keep himself on task. He seems unable to work without supervision. Now that there's funny, I don't care who you are! Is this serious? Your hitting the President because bad things are happening in the world while he has some down time? TOM! How COULD YOU be eating potato chips as the genocide was going on in Somalia! Come to think of it, how COULD I be reading a book or eating french fries when such an event was occurring? No, not because bad things happen in the world. Obama has been informed that there is a severe need for additional troops in Afghanistan. These men and women are spread too thin to go on the offensive and root out the bad guys, so they are able to regroup without interference. There are not enough troops, and the result is, they are being slaughtered. Obama is unable to make a decision, but has plenty of time to play golf, run around the world lobbying for Olympics, picking up undeserved awards and battling with Fox, Rush, Sean, and any other person or group that does not agree with him. The moral is at an all time low and we are now losing Iraq and Afghanistan. My recommendation is to pull all the troops in harms way and wait until we can get a leader in the White House that is capable of leading. Obama was never in the military, knows nothing about the military and is too arrogant to listen – even to his own appointees. But he never misses a "date" night or a round of golf. Rain in DC? No problem. Just take AF-1 to Arizona. This "president" has shown he does not care about our troops. As a Veteran, I am appalled and ashamed at this inept person masquerading as Commander in Chief. In a just world, Obama would be impeached for his complicity in causing troop deaths. These are ALL on him.